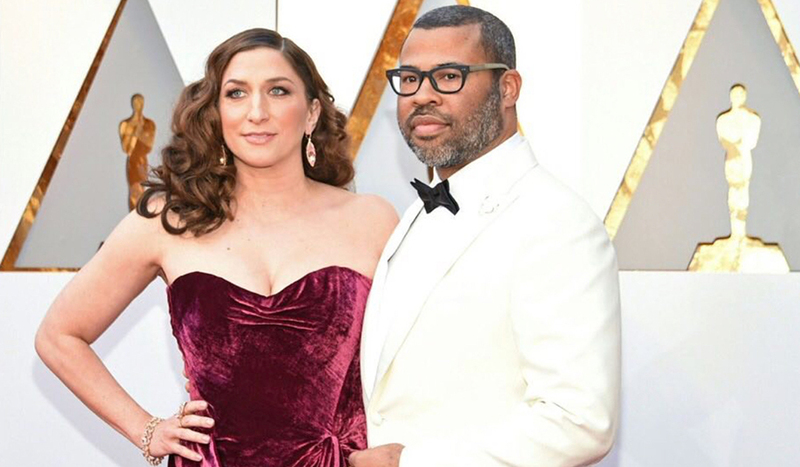 Get Out director/writer/producer Jordan Peele won his first Oscar for Best Original Screenplay, a day after winning two Independent Spirit Awards for Best Director and Best Feature. His wife, actress Chelsea Peretti, was by his side at both award ceremonies. Peretti, who is Jewish on her mother’s side, was introduced to Peele by her Brooklyn Nine-Nine co-star Andy Samberg five years ago, and they married in April 2016. Their son, Beaumont, was born last July. Peretti can currently be seen in Game Night, and Peele is the creator and producer of the TBS comedy The Last O.G., which premieres April 3. It stars Tracy Morgan as Tray, a newly released ex-con adjusting to life on the outside and Tiffany Haddish as his now-married ex-girlfriend and mother of the twin kids he didn’t know he fathered. 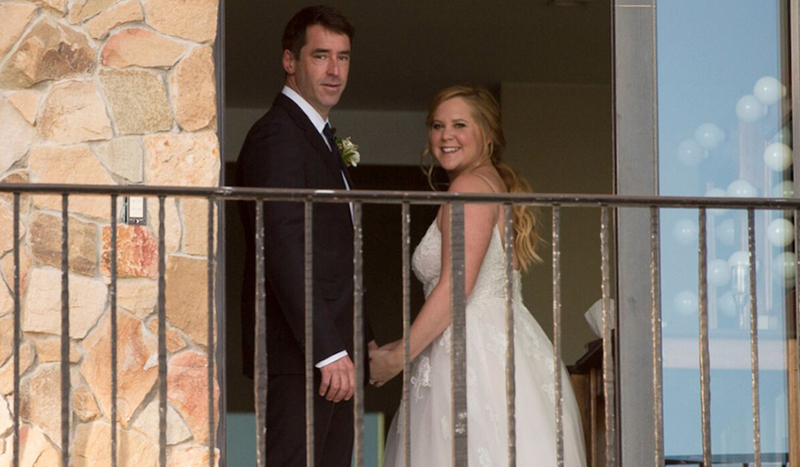 Amy Schumer is now a Mrs. The actress, who is Jewish, married chef Chris Fischer, who is not Jewish, on February 13 in a ceremony that incorporated the Jewish tradition of breaking the glass. Schumer’s friend, actor-comedian John Early, who became ordained online, officiated the wedding dressed in drag as Vicky from Netflix’s The Characters. Celebrity guests at the Malibu ceremony included Larry David, Jake Gyllenhaal, Jennifer Aniston, Judd Apatow and Jennifer Lawrence. Schumer’s dog Tati walked down the aisle with her. 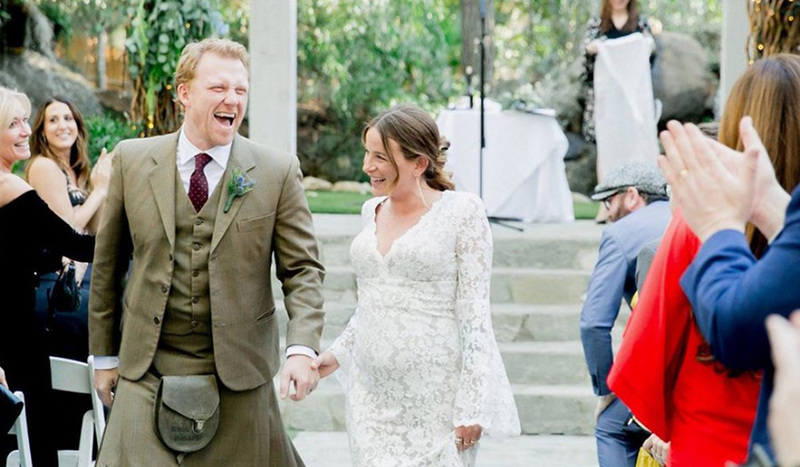 Scottish actor Kevin McKidd (Grey’s Anatomy), who is not Jewish, and Jewish chef Arielle Goldrath were married in a Jewish ceremony by Rabbi Emma Lutz in Malibu, CA. It’s the second marriage for McKidd, who has a teenage son and daughter with his ex-wife. His family will soon expand: He and his bride are expecting a baby. Mazel tov also to Voice coach Adam Levine and his model wife Behati Prinsloo on the February 15 birth of their second daughter, Geo Grace. Levine, who is Jewish, and Prinsloo, who is not, are also parents to Dusty Rose, 1½. Levine recently told Ellen DeGeneres that he wants “a lot” of kids. “I thrive in chaos,” he said. The Jewish actor, is best known for starring in Scrubs and Garden State and directing the latter and most recently, Going in Style. 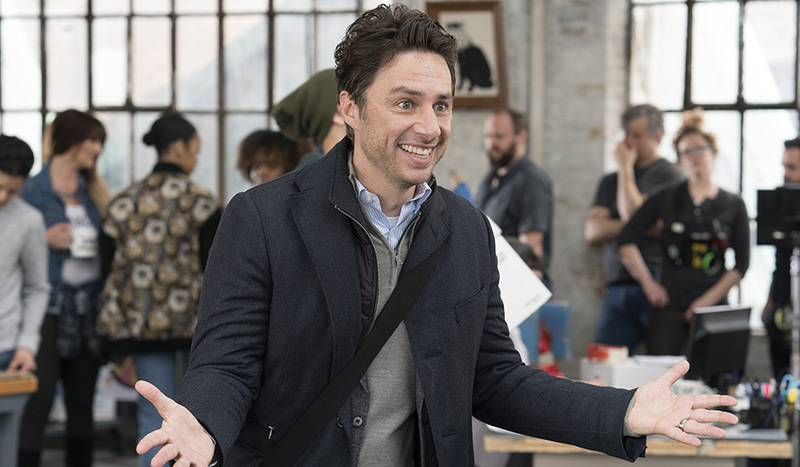 Braff describes Alex, Inc. as “a family show in the spirit of Black-ish or Modern Family. Parents won’t cringe,” he says. “I’m hoping people who grew up with Scrubs who are now parents themselves will love the tone.” It premieres March 28 on ABC. 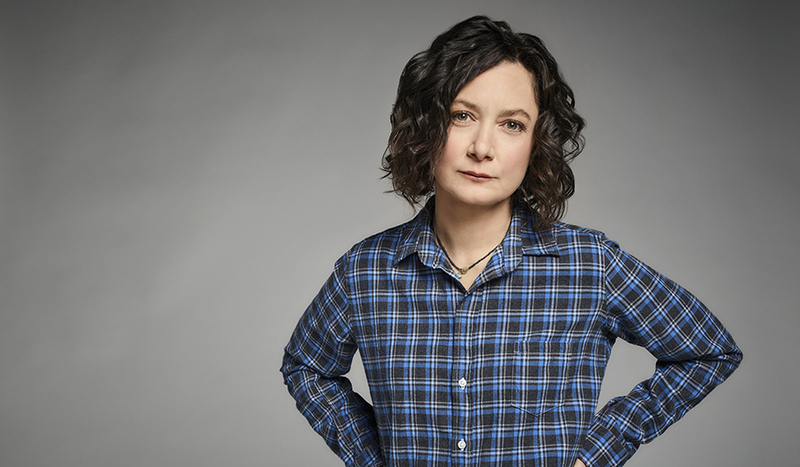 Sara Gilbert isn’t just reprising her role as Darlene in ABC’s reboot of Roseanne. This time, she’s an executive producer, and she was juggling that dual role with her jobs as co-host and producer of The Talk and a recurring role on CBS’ Living Biblically (which is produced by Johnny Galecki, who played David, Darlene’s boyfriend in the original Roseanne). “It was a crazy few months,” says Gilbert, grateful that Rosanne’s soundstage was right next to The Talk’s. “But there was a night where after the last taping of Roseanne, I went to tape Living Biblically. I had to skip the curtain call to get there,” she says. 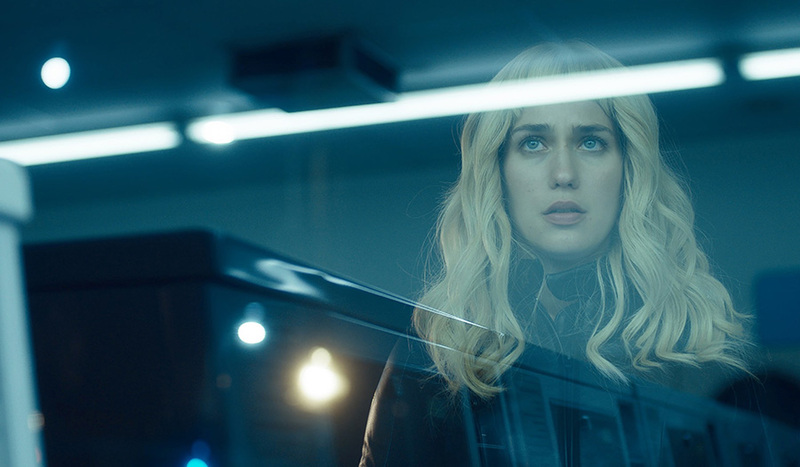 Lola Kirke (Mozart in the Jungle) and Zoe Kravitz (Big Little Lies) star together in the thriller Gemini. Zoe plays the murdered actress and Lola is her personal assistant, who tries to solve the mystery of her boss’ death. Of course, there’s no shortage of suspects who are angry with or jealous of the star. Both Kirke and Kravitz are the product of interfaith marriages. Kirke’s maternal grandmother was Israeli and grandfather was Iraqi-Jewish and British. Her father, drummer Simon Kirke, is not Jewish. Kravitz, the daughter of musician and actor Lenny Kravitz and actress Lisa Bonet, identifies as Jewish, the faith of her paternal grandfather and maternal grandmother. Gemini will be in theaters March 30. 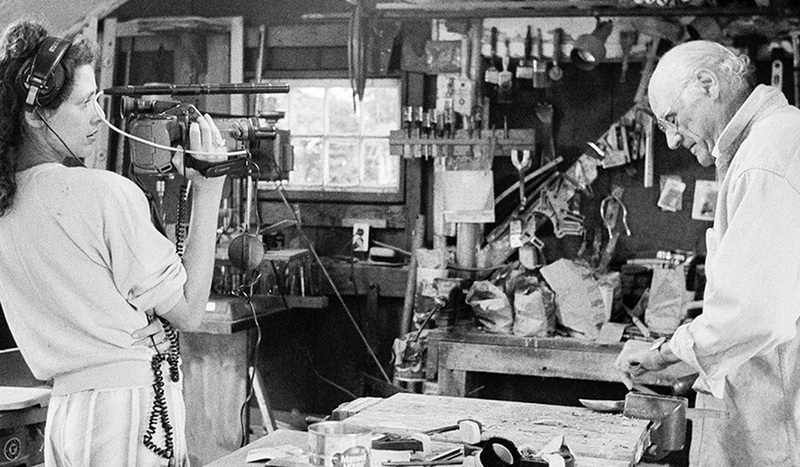 In Arthur Miller: Writer, premiering on HBO March 19, writer-director Rebecca Miller chronicles the life and career of her Pulitzer Prize winning playwright father. The daughter of Miller, who was Jewish, and photographer Inge Morath, who was not, collected 20 years of interviews with her dad and others (including director Mike Nichols) and combined them with photos and archive material to get inside the playwright’s motivation, inspiration and process. In an interfaith marriage herself, Miller is married to actor Daniel Day-Lewis, whose mother was Jewish and father was not. 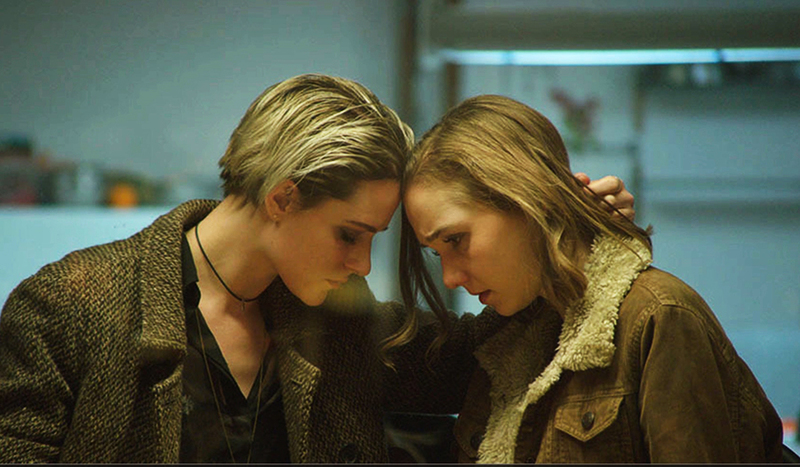 Evan Rachel Wood (Westworld) gives a mesmerizing performance as a troubled young woman whose reckless and inappropriate behavior stems from abuse and psychological damage in the dark drama Allure. The film, opening in New York and Los Angeles and available on Video on Demand (VOD) March 16, centers on Wood’s character Laura’s relationship with a teenage girl (Julia Sarah Stone) she meets while working a cleaning job at her house. When the girl runs away, Laura hides her, imprisons her and seduces her, with disastrous results for both of them. Wood, the daughter of a Christian father and a mother who converted to Judaism, was raised with both faiths but considers herself more spiritual that religious. She returns to HBO in the second season of Westworld on April 22.